"While he felt the Samsung Focus finished loading faster, a frame by frame examination does show the iPhone had 1 second on the Focus. It is however very clear there is not much between the two handsets, making browser performance another non-factor in choosing between the two devices." 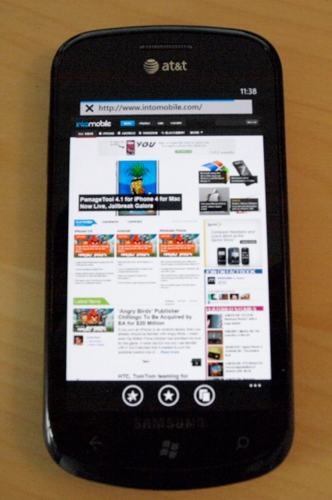 WMPoweruser.com has collected some evidence from Wirefly.com that suggests the browsing experience on a Windows Phone 7 device runs neck and neck with the iPhone 4. It's certainly a bit of a subjective test, and more exhaustive testing would be required to actually validate the results, but I'd say that performance is not too bad for this initial release. Personally, I find the ability to auto-flow text while you vary the zoom level while browsing, a feature offered on other platforms like the Android, to be the most desirable browsing feature. I hope to see it on the Windows Phone 7 platform down the road. "Personally, I find the ability to auto-flow text while you vary the zoom level while browsing, a feature offered on other platforms like the Android, to be the most desirable browsing feature. I hope to see it on the Windows Phone 7 platform down the road." That is exactly what gives me claustrophobia after trading my HD2 for an iPhone4. Two zoomlevels: the 1st too small to read, the second too big with too little text to read. And no in-between. I'm really longing back for Opera 10 mobile. If WP7 does that tomorrow it's sayonara iPhone!